The electrolytic method is an effective, cheap(! ), gentle and effective method of rust removal which causes minimal alteration to the metal surface of the article to be cleaned. It may seem complex, but is easy to set up and use. It does not damage the underlying material, and is used in restoration work of old objects. What is the method? A technique for returning surface rust to iron. It uses the effect of an electric current and a suitable electrolyte (solution). 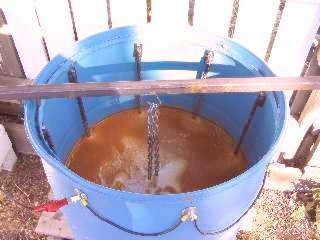 The electrolytic method involves immersing the rusty article in an electrically-conducting solution of washing soda (sodium carbonate). The major advantage of this method is that returns the surface rust back into iron, whereas the acid bath method (and mechanical methods) remove the surface rust and a (small) amount of the underlying surface, including un-rusted surfaces. The electrolytic method removes nothing and un-rusted metal is not affected in any way. It can also be used most times to free screws etc that are "rusted tight" without the need for force, which can break things. It is safe - the solutions used are not hazardous; the voltages and currents are low so there is no electrical hazard. No noxious fumes are produced. The method is self limiting, it is impossible to overclean an object. Mix up the solution in a non-conductive plastic bucket or other suitable container at about 10 gram/litre (about 1 teaspoon per pint). The concentration may be increased a bit but the results will not change greatly. Make sure all the crystals have dissolved before using. Place article into the electrolyte solution, completely submerging it. Connect the negative lead from the power supply to the article (cathode), and the positive lead to a steel electrode (anode) dipping into the solution. When the current is turned on, an electrochemical reduction reaction occurs at the metal/oxide interface on the article's surface. See Fig. 1 below for the set-up. Electrolytic reactions will not strip paint, so remove any paint first. Hydrogen bubbles will start forming on the negative electrode. This is normal - No bubbles equals no or little action. When rust is removed, rinse the article under running cold water. A 6V or 12V automotive battery charger is all that is required, provided it can produce a few amps of direct (DC) current, is ideal for this job. A current of about two amps at 12 volts is typical (one with an ammeter is useful as it shows you what is happening). Normally the positive lead from the power supply to the anode is red coloured, and the negative lead black, however any colour may be used. A car battery will also work as the DC power source. Use steel for the positive electrode (anode). Do not use copper or other metals, as these will be rapidly eaten away. The steel electrode will also be eaten away, and should be regarded as disposible. Some sludge or gunk will build up on this electrode, this is normal and part of the process, and may need to be brushed off at intervals regularly. See safety notes below. Multiple anodes may be used for a more even distribution of the current. See Fig. 2 above for an example. The positive lead from the power supply should be connected to the anode, above where it emerges from the solution. If this attachment point is submerged below the surface, it will be eaten away. The negative lead is connected to the rusty article. In this case, the attachment clip may be submerged under the solution - corrosion does not occur at the negative electrode (cathode). It is important to have good contacts, cleaned by wire brush or emery paper if required. The article being cleaned and the positive electrode should be separated by at least a few inches. If they are allowed to touch, a short circuit will occur and the power supply may be damaged. Be careful not to exceed the capacity of your power source. The current may be reduced by increasing the separation between the article and the anode, or by diluting the solution with water. Removal of rust will reveal any damage to the surface (such as pitting) which has already occurred. This method cannot replace any base metal already lost to rust. The time required for effective de-rusting will vary from 30 minutes for small objects to many hours for large objects. Overnight operation is common. No harm is done by leaving turned on for long periods, as long as the power source does not overheat, or gases do not build up in an unventilated area. Small items may be placed on a stainless steel grid or rack suspended in the solution and electrically connected to the negative lead. The rusty articles make electrical contact with the grid and do not need to be individually connected. When completely finished, dispose of the used electrolyte bath in an environmentally thoughtful manner. Washing soda solutions are alkaline and will irritate the skin and (especially) the eyes. Do not try to use other salts - no better results will be obtained and dangerous effects may occur. Caustic soda, for example, is far too corrosive, and even strong solutions of ordinary table salt will generate toxic chlorine gas at the positive electrode. It is recommended to wear gloves. Wash off any spills immediately. The power source (battery charger) is connected to the mains supply and should be shielded or positioned so that any spills cannot touch or enter the battery charger - especially when it is unattended. The low voltage leads from the power supply are relatively safe, but you may still get a tingle if you put your hands in the solution or touch the electrodes while the current is on. Turn off before making any adjustments. A chemical reaction occurs in the bath which generates hydrogen gas (at the negative electrode) and oxygen (at the positive electrode). This is a potentially explosive mix (Remember the Hindenburg!). Keep naked flames (including cigarettes) away, and avoid sparks from the leads. Adequate ventilation is required. Do not use this method in a confined or poorly ventilated area. 124 Text and photos Copyright © 2006-2019 SMEX, All rights reserved.